New helix reel mixer can handle numerous materials and provides efficiency and quick turnaround. Kuhn North America has totally redesigned the RC 200 Series Commercial Reel Mixer with a helix reel as the active ingredient in its recipe for more efficient mixing and fast mix/dump cycles. The helix reel offers faster and more efficient mixing with improved load leveling ability with any ration. The heavy-duty drive option offers extended life, even in the most extreme cycles and gives producers the ability to handle the heaviest feedstuffs. With truck, trailer and stationary models and mixing capacities of 500-950 cubic feet, there's a machine to fit most operations. 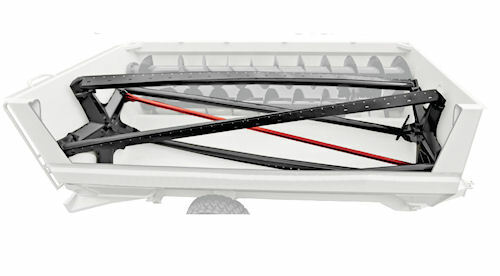 For more information on the new RC 200, visit www.kuhnnorthamerica.com. variety of materials and offers quicker turnarounds in mixing and loading.